The Music goes Boom Boom Boom at the Redwood Room! July 6, 2015 July 6, 2015 ~ Trevis Dampier Sr. 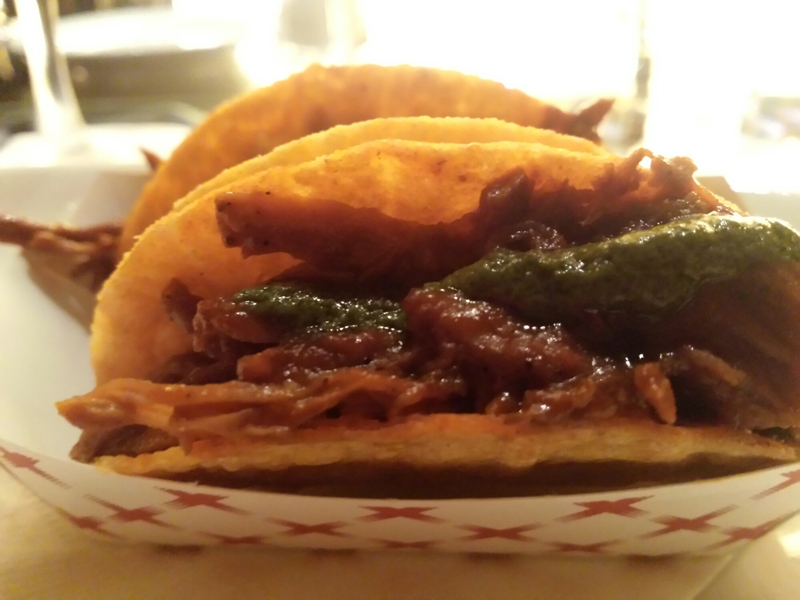 The English translation of al pastor is “in the style of the shepherd.” Mexican shepherds adapted the Lebanese style of spit-roasting lamb, using pork instead, and al pastor tacos became a beloved Mexican food the world over. We just spent the day at the Fillmore Jazz Festival here in San Francisco and boy was that a blast! I decided to come down for a drink and a small appetizer at the Redwood Room while my wife is sound asleep upstairs. She’s light weight when it comes to alcohol and boy did we get our fill at the Festival. Chillin here in the Redwood Room is really cool…. They have an elegant vibe, dark and romantic but yet cool,chill and new age. They have these digital paintings on the wall that change up on you as you sit cozy in elegance with your drinks and appetizers. A Millennium looking Mona Lisa with separate paintings of distinguished gentleman that wink at you and a lit up bottle selection that intrigues the eye. I really felt good sitting in here as it made me feel relaxed, subtle and excited at the same time. While I enjoyed my Manhattan, I made sure to try an appetizer on their ritzy establishment. First thing that caught my eye was the Pastor Tacos so I went with that. I expected to receive corn tortillas on a large plate but to my surprise, they were mini hard taco shells filled with a utmost delight. I grabbed one of these luscious rubies and took a bite.. I love that hard taco shell! Instant gratification when this juicy, pulled pork touches my gums..Wow! The sauce and salsa have a great spice that leaves you begging for more and spiced perfectly so that only your alcoholic beverage can be used to cool it off. True live action eating! Good job Redwood Room! Next time you visit SF then be sure to stop by the Redwood Room and don’t forget to take some pictures on the big chair before you walk in. It is definitely a memorable place to experience! < Previous I’ll Drive in Traffic Bumper to Bumper for a Massive Meal at Claim Jumpers! Next > Fillmore San Francisco Jazz with Pizzazz!